Location: a.k.a. "Rob" on Scoobycity! I've posted this up on a couple of other forums, so apologies if any of you have already seen it..............but I think it's such a good pic it deserves another exhibition! That is amazing mate, speachless. Got a hi res version of it? Very nice, trees spoil it though! nice mate,sunsets not bad either!! !lollike ure car,it looks spot on! Thanks for the compliments guys. I can't take credit for taking the pic itself though, that was down to my cars "official photographer", Scrappy of Scoobycity! White Knight that is a loverly car, although i think that the 'Toyo and the EBC brakes' graphics on the door spoils it a tad. thanks for the compliments again, and SCOO8Y MAD, I respect your opinion! there's a few different variations on the Cusco theme, some with less manufacturers logos, some with more. I just wanted to represent everything I've got fitted to the car, rather than just some generic stuff. I would rather have a car stickerd up with manufactures logos that i hace their parts on the car rather than haveing them just for looks. That i respect mate. My Old terzo with the WR Sport Package had the same Front. No Scooby Front will ever be that Sweet again. Anyone know where you can get the cusco theme from? 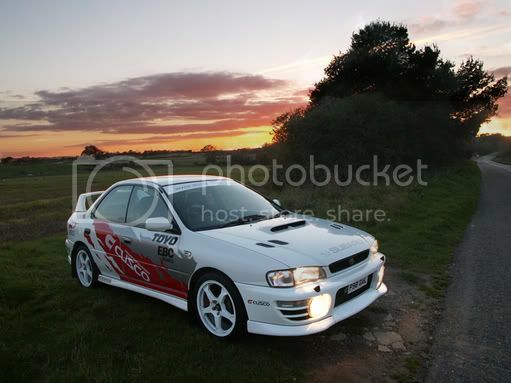 I just got hold of as many pics of the proper Cusco Impreza's as I could, sent them to my local graphics shop, and said "I want it to look like that"!!! They did the rest for me. Speak to Adam at J.D'Signs on 01366 377366, they're in Southery near Downham Market.